Ode was never meant to be born. An outcast from birth, he discovered how to control his unique, remarkable gift entirely on his own. Unlike the other people of his tribe, Ode can fly. Sometimes his body will shudder and shift, and then Ode will transform. He becomes a great white bird with feathers as pale as the snow. He becomes a swan. He can fly above the tribe’s tepees and soar over the emerald forests of the Wild Lands. But even with his gift, he cannot save his family from the oncoming war. The Magical Cleansing is spreading across the realm, and strangers arrive from foreign lands bringing with them bloodshed and fear. With the help of his gift, Ode flees to a distant island where answers, Magic, and a girl with golden hair await him. He must be brave, and he must be wise. And he must never turn back. Rose Mannering is an author and lifelong book lover. By day she works in publishing and by night she dreams up dragons, unicorns and curses that last hundreds of years. 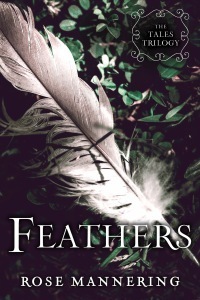 She writes 'The Tales Trilogy' for YA fantasy and fairy-tale lovers with 'Roses' and 'Feathers' in the series currently available and published by Sky Pony Press. She also writes picture books for little readers with big hearts. Her first, 'The Spotty Dotty Daffodil', is currently available and her second, 'Boo's Beard', has just been released. I enjoyed this story a little more than the first one. I love that Ode is a guy in this instead of a woman like the original and retellings are. And I like that she has connected the stories. Whatever is special about Ode seems like it might play a huge role in the oncoming war.